With the .NET Core support added to AWS lambda, it is a great platform to run services or sites that are stateless and lightweight. A free AWS account is enough to try this, up to one million requests per month. WebSharper 4.2's new .NET Core templates can be quickly configured to be published on Lambda. You can use this guide for signing up for an AWS account, and to download and configure your credentials for use by the command tool or the AWS Toolkit for Visual Studio. The AWSSDK.Extensions.NETCore.Setup will be only needed if you want to use other AWS services like S3 or DynamoDB. Although Microsoft.AspNetCore.All is already installed for the template, AWS Lambda supports it only up to version 2.0.3, so it needs to be downgraded. Open your Program.cs or Program.fs file, and add this new class that will work as the entry point for the Lambda function. You can leave the existing Program class/module, so the application will continue to run locally with Kestrel or in IIS too. Modify assembly and namespace name from LambdaWS to the name of your project if different. This will ask for multiple additional inputs. First the name of the stack. You can give a unique name to create a new one. Then the name of an S3 bucket. Create one in AWS Console for the region you are targeting and paste its name. 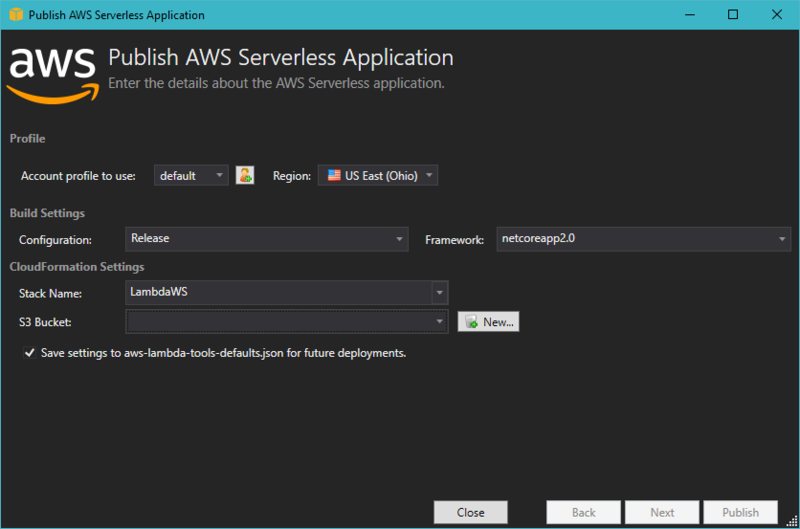 Next the serverless template file, enter serverless.template. Last the region where you want to deploy to (for example us-east-2, must be where your S3 bucket is located). After the deployment finishes, you can check your Lambda functions in AWS Console to find the RootPathFunction belonging to the newly deployed stack. Click it then API Gateway, scroll down to see its properties and open dropdown to see the Invoke URL where you can reach your application. If you are using Visual Studio, it is helpful to install the AWS Toolkit for Visual Studio. This adds the AWS Explorer to view and manage your deployed resources, and also right-click commands for the Solution Explorer to deploy projects. Clicking Publish to AWS Lambda... on the project node opens a dialog where you can set your AWS account, region and stack name. These will all get saved automatically to a aws-lambda-tools-defaults.json file upon publishing, so you don't need to specify them again when updating. Click Publish and when status is displaying CREATE_COMPLETE, you can click the link at AWS Serverless URL to see the sample page running. Optimizing deployment so that static files are using S3 instead of the lambda function (more cost effective). Using S3 from within a lambda function. Creating a JSON API in WebSharper to run on Lambda. Logging and configuration integration with Lambda.